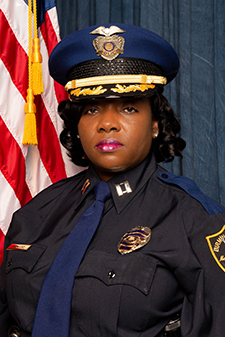 Captain NaShonda G. Howard has 24 years of law enforcement experience with the Birmingham Police Department. She served in the positions of Patrol Officer, Detective and Sergeant at West and South Precincts respectively and Internal Affairs. She was promoted to the rank of Lieutenant and as commander of the 911 Call Center, she developed and implemented the Communication Training Officer (CTO) program and certifications for Public Safety Dispatchers I and II’s to establish best practices in accordance to APCO and NENA standards. In August 2012, she spearheaded the renovations of the 911 Call Center along with the city’s Information Management Systems staff. In 2013, at the rank of Lieutenant, she served as the Executive Assistant to the Deputy Chief of Support Services. Captain Howard served as the Interim Chief Jail Administrator of the Birmingham Detention Division from May 2015 through June 2016. In October 2015, Captain Howard was promoted to the rank of Captain and has commanded the Crimes against Property Unit comprised of Burglary, Auto Theft and Major Fraud and the Internal Affairs Division. Presently, Captain Howard is commander of the Special Victims Unit. Captain Howard is a FBI – LEEDA Trilogy Award recipient and collaborated with FBI- LEEDA staff and organized the 2018 FBI – LEEDA Conference in the City of Birmingham. She worked with the National Network for Safe Communities (NNSC) by implementing Listening Sessions as a part of the National Initiative for Building Community Trust and Justice. Captain Howard earned a Bachelor of Arts Degree in Political Science from the University of Alabama, Tuscaloosa, and a Juris Doctor Degree from Miles College School of Law, Fairfield, Alabama.